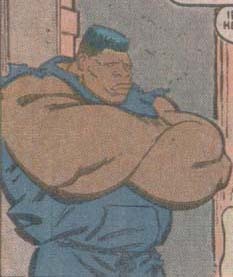 Powers/Abilities: Brute is extremely large for his age and superhumanly strong and tough. He's not that bright though. History: (Power Pack I#32 (fb) - BTS) - When people in his old neighborhood made fun of Brute for being too stupid to cross the street on his own he tried it and was hit by a car. The car was smashed, but apparently Brute had no problem. (Power Pack I#31) - With the rest of Trash, Brute ran drugs for the Garbage Man. This led to a confrontation with Power Pack and a battle that destroyed a crackhouse. (Power Pack I#32) - The Garbage Man beat Trash for failing to protect his client's crackhouse from Power Pack, then sent them on another mission. Brute thought that he should quit the team, but the others convinced him to stay. When the team led Power Pack to Garbage Man's hideout and defeated them, Brute was the first to start feeling bad for the heroes. When Garbage Man demanded they kill Power Pack, Brute and the others refused, causing Garbage Man to attack them. Brute saved Katie Power from being stomped by Garbage Man and the teams worked together to take Garbage Man out. 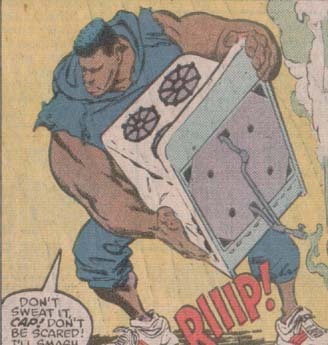 After Garbage Man was defeated and Power Pack tried to talk Trash into turning their lives around, Brute seemed interested in the idea, but the team didn't think it would work. When Trash appeared again, having moved to Chicago, Brute and Airhead weren't with them. The members who did show up there were confirmed to be mutants, so it is possible that Brute was too. When Brute was thinking about returning to his old neighborhood Airhead said he should stay with them because it was better than an orphanage. I take that me mean that Brute's parents are probably dead.